HolyJuan: Verizon gets your consent by not getting your consent. Verizon gets your consent by not getting your consent. Verizon’s definition of “getting your consent” is not getting your consent and unless you un-give them the original assumption of consent, you have, in their eyes, given your full consent. I’m pissed that their definition of “giving consent” is doing nothing. To not give consent, I have to call a number and “opt out” of my consent that I never gave. One of my favorite sayings is, "Silence means consent," but this seems out of line. The FCC requires they get my consent and damnit they should have to get it from me. I just called and the automated system was painless to un-consent. Maybe I have not been reading my Customer Agreements and perhaps this is commonplace, but it just stinks. 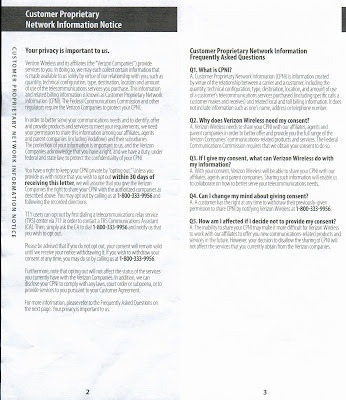 If you are a Verizon customer and want to “opt out” of your assumption of consent, do so at 800-333-9956. If any of you know why this is something I should be un-opting out of, please help me by explaining why. Thanks for posting the phone number. Yes, it is outrageous that "sharing" our private information is the default! This is really common with companies actually. Their way of "being good citizen-companies" and sticking to the law. All I have to say is, "Verizon can kiss my little white a$$". BTW, don't move to another state, they will start your account over and charge you new startup fees!! yeah, consumerist.com has taught me that Verizon is essentially > or = Satan. Same concept as when you sign up for something online and they pre-check all the "sign me up for stupid email marketing" offers. Grrrr... I am so angry! I am so mad I want to.... what's that? Skullys? Yeah, I'll meet ya there.